China, it's rapidly becoming clear, has a trash problem. 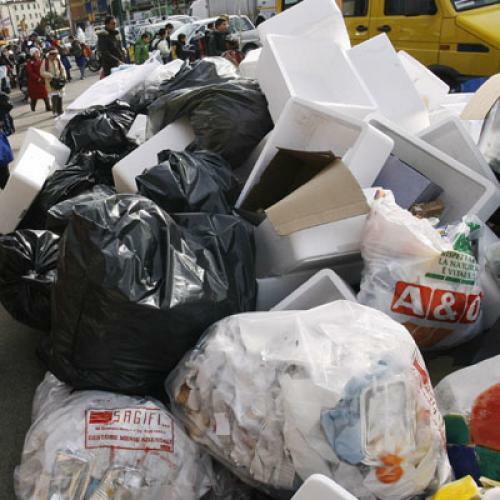 As the country has gotten wealthier, it's become the world's largest producer of household garbage. Packaging, old electronics, newspaper, bottles, plain old junk—all of it's piling up and there's increasingly no place to dump it. 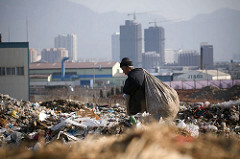 As Keith Bradsher reported in The New York Times yesterday, "Beijing officials warned in June that all of the city’s landfills would run out of space within five years." One remedy is to incinerate the trash, which China has been doing. The incinerators take up less real estate, they can do double duty by generating electricity, and they reduce the amount of planet-warming methane that's emitted by trash decaying in landfills. But even that's no free lunch: Most of China's incinerators are highly toxic, emitting mercury and dioxins, which have been linked to health problems and can waft all the way across the Pacific. Residents in Shanghai and China are starting to demand stricter pollution standards for incinerators, like in Europe. Trouble is, the new generation of incinerators are pricey. While it is difficult to estimate the quantity of U.S. hazardous waste exports (since data is not kept), insiders in the electronic waste industry, according to the Basel Action Network’s “Exporting Harm” 2002 report, believe that 80 percent of what comes through their doors will be shipped to Asia, and 90 percent of that is destined for China. Trying to find U.S. waste? Look beyond our borders. India and China, if they try to develop with an outdated polluting model, will find no market for their own trash. Empowering their poor will only work through cleaner growth. That leaves a couple options. China could keep building cheap, dirty incinerators. If they do that, the World Bank figures global atmospheric levels of dioxins will double. Not good. China could start building cleaner, costlier incinerators—a running battle, that. Alternatively, there's the recycle/reduce/reuse route, which can not only curb the amount of trash created, but can even help incinerators run cleaner. At the very end of his piece, Bradsher gets a Chinese waste engineer to comment on how Chinese feel about recycling: "No one really cares." Yikes. Though it's hard to imagine that attitude lasting forever.